Now, scientists from the lab of Ardemis Boghossian at EPFL, have been able to use directed evolution to build not proteins, but synthetic nanoparticles. These nanoparticles are used as optical biosensors – tiny devices that use light to detect biological molecules in air, water, or blood. Optical biosensors are widely used in biological research, drug development, and medical diagnostics, such as real-time monitoring of insulin and glucose in diabetics. Up until now, it was impossible to reproduce the process of growing nanowires on silicon semiconductors – there was no way to repeatedly produce homogeneous nanowires in specific positions. But researchers from EPFL’s Laboratory of Semiconductor Materials, run by Anna Fontcuberta i Morral, together with colleagues from MIT and the IOFFE Institute, have come up with a way of growing nanowire networks in a highly controlled and fully reproducible manner. The key was to understand what happens at the onset of nanowire growth, which goes against currently accepted theories. Their work has been published in Nature Communications. Despite appearances, standard laser beams are not as straight as they seem: as they travel, they expand ever so slightly, leading to a loss in density as they go. But LakeDiamond’s system produces a laser beam with a wavelength of 1.5 µm that, in addition to being safe, can travel much farther without losing strength. “Systems developed by other companies and labs, often for military applications, employ lasers that are more powerful and thus more dangerous for humans,” says Pascal Gallo, CEO of LakeDiamond. His company took the opposite tack: their technology transforms the rays emitted by a simple low-power diode into a high-quality laser beam. Their beam has a larger diameter, and its rays remain parallel over a longer distance – in this case up to several hundred meters. In LakeDiamond’s laser, the light produced by a diode is directed at a booster composed of reflective material, an optical component and a small metal plate to absorb the heat. The breakthrough lies not with this set-up, which already exists, but with the fact that the emitted beam is only a few dozen watts strong. The secret is using a small square lab-grown diamond as the optical component, as this delivers unparalleled performance. LakeDiamond’s system holds the world record for continuous operation using a wavelength in the middle of the infrared range – it delivers more than 30 watts in its base configuration. “That’s equivalent to around 10,000 laser pointers,” adds Gallo. The lab-grown diamonds’ key properties include high transparency and thermal conductivity. Achieving those things – and mastering the nano-etching process – took the researchers over ten years of development. LakeDiamond grows its diamonds through a process of chemical vapor deposition, an approach that ensures their purity and reproducibility. The surfaces of the resulting tiny square diamonds are then sculpted at the nano level using expertise developed in Niels Quack’s lab at EPFL (read the EPFL article on this topic). Thanks to their inherent properties and etched shapes, the diamonds are able to transfer heat to a small metal plate that dissipates it, while at the same time reflecting light in such a way as to create a laser beam. EPFL astrophysicists actively participated in the discovery of a very rare star, which is particularly old and metal-poor. As a messenger from the distant past, it will allow the scientists to learn more about the young Universe, right after the Big Bang. “We made a major discovery, which questions our understanding of the formation of the first generations of stars in the universe”. Researcher at EPFL Laboratory of astrophysics (LASTRO), Pascale Jablonka is a founding member of the Pristine survey, an international project dedicated to the search of the most ancient and metal-poor stars. It allowed the recent identification of an extremely rare object. Called Pristine 221, it is among the 10 most metal-poor stars known to date in the halo of our Galaxy. Moreover, it is one out of two outstanding stars that are almost totally carbon free. This breakthrough has recently been published in the journal Monthly Notices of the Royal Astronomical Society (MNRAS). For the study of the early universe, astronomers have different methods at their disposal: One is to look far into the Universe and back in time, to see the first stars and galaxies growing. Another option is to examine the oldest surviving stars of our home galaxy, the Milky Way, for information from the early universe. The Pristine survey, led by the Leibniz Institute for Astrophysics Potsdam (AIP) and the University of Strasbourg, is looking for exactly these pristine stars. To find these oldest messengers among the overwhelming population of younger stars is no easy task. Just after the Big Bang, the Universe was filled with hydrogen and helium and a bit of lithium. No heavier elements were around, as these are only synthesized in the hot interior of stars – and those did not exist yet. Our Sun has about 2 % of heavier elements in its atmosphere, as can be seen when we make a spectrum of its light. Because of this fact, astrophysicists can conclude that the sun has emerged as part of a later generation of stars – and has “recycled” in its atmosphere the products of the stars that lived long before it and have since died out. In searching for the oldest stars, scientists look for stars with much more pristine atmospheres than our Sun. The more pristine the atmosphere, the earlier the generation in which this star was born. Studying stars of different generations allows us to understand the formation history of the Galaxy – an area of research that therefore is also called near-field cosmology. The Pristine team used a special narrow band filter on the Canada-France-Hawaii Telescope to preselect candidate stars with pristine atmospheres. This step was then followed by a detailed spectroscopic campaign with the telescopes of the Isaac Newton Group in Spain and the European Southern Observatory in Chile. EPFL’s researchers Pascale Jablonka and Carmela Lardo formed one out of three teams, with the Paris Observatory and the Instituto de Astrofísica de Canarias, in charge of the spectroscopic analysis and the chemical abundance measurements, that led to the identification of this very special star. They could demonstrate that the star had indeed very few heavy elements in its atmosphere. Most elements are depleted by factors 10.000 to 100.000 compared to the Sun. Additionally, its detailed pattern of different elements stands out. Whereas usually extremely metal-poor stars show a very large enhancement in carbon, this star does not. This makes this star the second of its kind and an important messenger from the early Universe“, says Else Starkenburg, researcher at AIP and first author of the study. Artistic image of the first supernovas in the Milky Way. Pristine 221.8781 + 9.7844 star formed from the material ejected by these first supernovae. Credit: Gabriel Pérez, SMM (IAC). An international team of researchers, with doctors at the Institute of Astrophysics of the Canary Islands David Aguado, Jonay González and Carlos Allende part, has discovered the existence of a very metal-poor star, one of the oldest in the Milky Way and, therefore, an excellent messenger of the early universe. To reach these conclusions, have made detailed follow-up studies with ISIS instrument, the William Herschel Telescope, and the IDS instrument on the telescope Isaac Newton, both of the Isaac Newton Group of Telescopes (ING), installed in the Roque de los Muchachos Observatory (Garafía, La Palma). “The spectroscopic images of intermediate resolution, obtained in INT and WHT telescopes on La Palma have enabled us to check the low carbon content, which in this type of stars is usually very abundant,” says Carlos Allende, one of the researchers this project. This study also used high-resolution spectroscopy obtained with the UVES spectrograph on the VLT (Paranal, ESO). “The spectroscopic data of high resolution UVES on the VLT have led to measure the abundance of lithium in the atmosphere of this star, which provides additional information about the origin of the Universe,” says Jonay González, researcher Ramon y Cajal IAC and collaborator Pristine in the project. Else Starkenburg David S. Aguado, Piercarlo Bonifacio, Elisabetta Caffau, Pascale Jablonka, Carmela Lardo, Nicolas Martin, Ruben Sanchez-Janssen, Federico Sestito, Kim A.Venn, Kris Youakim, Carlos Allende Prieto, Anke Arentsen, Marc Gentile, Jonay I. Gonzalez Hernandez, Collin Kielty, Helmer H. Koppelman, Nicolas Longeard, Eline Tolstoy, Raymond G. Carlberg, Patrick Côté, Morgan Fouesneau, Vanessa Hill, Alan W. McConnachie, Julio F. Navarro. 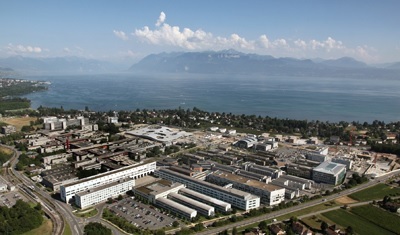 See the full EPFL article here . See the full IAC article here. Human centrioles labelled with antibodies against two proteins (Cep152, HsSAS-6) and imaged using super-resolution microscopy. From many individual particles showing projections of the centriole complex in various orientations (upper panel), by using a fused intermediate (yellow, lower panel), the newly developed method allows now to reconstruct a multicolor 3D model (lower panel) (credit: Christian Sieben/EPFL). A new technique developed by EPFL overcomes the noise and color limitations of super-resolution microscopy by creating three-dimensional reconstructions from single-color, two-dimensional images of protein complexes. Super-resolution microscopy is a technique that can “see” beyond the diffraction limit of light. The technique has garnered increasing interest recently, especially since its developers won the Nobel Prize in Chemistry in 2014. By exploiting fluorescence, super-resolution microscopy now allows scientists to observe cells and their interior structures and organelles in a way never before possible. Many of the molecular complexes inside cells are made up of multiple proteins. Since current techniques of super-resolution microscopy typically can only use one or two fluorescent colors, it is difficult to observe different proteins and decipher the complex architecture and underlying assembly mechanisms of the cell’s interior structures. An even greater challenge is to overcome the noise inherent to the super-resolution methods and fluorescent labeling, to achieve the full resolution potential. Scientists from the lab of Suliana Manley at EPFL have now solved both problems by developing a new method to analyze and reconstruct super-resolution images and re-align them in a way that multiple proteins can be placed within a single 3D volume. The method works with images taken with large field-of-view super-resolution microscopy, with each image containing hundreds of two-dimensional projections of a labeled structure in parallel. Each 2D view represents a slightly different orientation of the structure, so that with a dataset of thousands of views, the method can computationally reconstruct and align the 2D images into a 3D volume. By combining information from a large number of single images, the noise is reduced and the effective resolution of the 3D reconstruction is enhanced. With the help of Pierre Gönczy’s lab at EPFL, the researchers tested the method on human centriole complexes. Centrioles are pairs of cylindrical molecular assemblies that are crucial in helping the cell divide. Using the new multicolor super-resolution reconstruction method, the researchers were able to uncover the 3D architecture of four proteins critical for centriolar assembly during organelle biogenesis. EPFL scientists have completed the fastidious task of analyzing 27 dwarf galaxies in detail, identifying the conditions under which they were formed and how they’ve since evolved. These small-scale galaxies are perfect for studying the mechanisms of new star formation and the very first steps in the creation of the universe. Dwarf galaxies don’t emit much light and are therefore hard to observe, but they have a lot to teach us about how the universe was created. A team of scientists from EPFL’s Laboratory of Astrophysics (LASTRO) meticulously studied 27 such galaxies and found a surprising degree of variation in the mechanisms by which their stars were formed. The results of their painstaking work was published in Astronomy & Astrophysics. “Dwarf galaxies are the smallest and probably the oldest galaxies in the universe. Under standard cosmology theory, larger galaxies are formed by the merger of these smaller ones,” says Yves Revaz, a galaxy dynamics expert at LASTRO. While they may be called “dwarves,” they are in fact huge and can weigh anywhere between hundreds of thousands and several million times as much as the sun. They are also the galaxies with the most dark matter. The LASTRO team therefore had to develop highly sophisticated computer models to study these galaxies’ properties, size and temporality – all of which go well beyond our basic understanding. Their models take into account each of the galaxies’ components – gases, stars and dark matter – as well as the relationship between dark matter and visible matter (called “baryonic matter” in astrophysics). The models also factor in the conditions under which matter was formed when the universe was first created some 14 billion years ago – conditions that are now known thanks to recent space missions carried out to discover the signatures of the Big Bang. To analyze the dwarf galaxies, the scientists first took each model and went step by step through the galaxies’ key characteristics like how much gas (mainly hydrogen) they contain, the heating and cooling of their interstellar mediums, their compression and expansion processes, the successive generations of their stars, those stars’ supernovae, and the resulting release of an array of chemicals. The scientists then compared the results of their models with data that had been obtained by observing dwarf galaxies – more specifically, those orbiting our galaxy, the Milky Way, and its neighboring galaxy, Andromeda (M31) – using eight-meter optical telescopes, the biggest that are currently out there. These dwarf galaxies form part of what is called the Local Group and are close enough for astrophysicists to be able to obtain accurate information on the ages and chemical components of individual stars. Making sure that the models’ results match empirical data is essential if the scientists want to use them to test their theories about dark matter, the kinds of objects responsible for the reionization of the universe, and the conditions and time periods for new star formation. “The advantage of dwarf galaxies is that they respond very well to even minor changes in conditions, making them excellent guinea pigs for studying galaxies in general,” says Pascale Jablonka, a LASTRO researcher specialized in spectroscopy and galaxies’ chemical development and co-author of the study. For instance, by analyzing the light that stars emit, she was able to determine their chemical composition and how long it took them to form. “Our models enabled us to create a database of many different types of stellar activity and gave us valuable insight into the factors that can cause star formation to speed up, slow down or even stop altogether,” says Revaz. Based on the data they collected – which include an impressive number of different star-formation mechanisms given how “small” dwarf galaxies are – the LASTRO team found that the specific mechanism used depends on the density of the galaxy’s dark and baryonic matter. That density determines whether a galaxy will keep on making stars or suddenly stop. If a dwarf galaxy’s matter is too dispersed, then its hydrogen will get too hot and evaporate, meaning it can no longer form stars. If on the other hand a dwarf galaxy has a dense halo of dark matter protecting it, then star formation will continue apace.